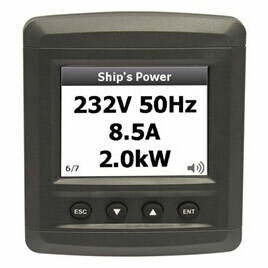 The Marinco Digital Monitoring System is a state of the art full colour monitor desinged to meet the systems monitoring requirements of today’s modern vessel and recreational vehicle. Complex AC and DC electrical installations on board are becoming more common place. The ACSM displays feature clear, extra large type face. This allows for more detailed on-screen information and increased clarity. The screen has back lighting for easy night time viewing. The ACSM has 3 generic user configurable inputs and will monitor the AC voltage, current and frequency on your vessel or motor home.